Now Reading: Sure you know frizz. But do you really understand it? You don’t have enough fingers on your hands to count the number of times you’ve said this, right? Probably. Nobody likes frizz. Least of all you - who has to deal with it every time the weather decides to change. 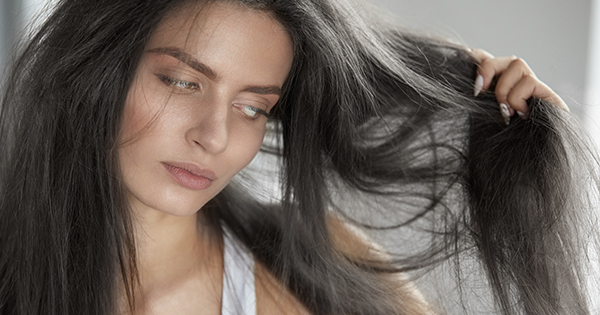 You may be surprised to know, however, that weather isn’t the only reason for frizzy hair. There’s legitimate science behind frizz and we’re about to uncover it. Frizzy hair basically stems from a lack of moisture. Your cuticles lie or stay flat depending upon the moisture in your hair, which is dependent upon natural oils i.e. sebum. When these moisture levels are low, your hair is stripped off natural oils. This causes your cuticles – the outermost part of your hair shaft, to rise and take in the moisture from the atmosphere, giving you that extraordinary look. The opposite is when the moisture levels are balanced. Your cuticles are coated with enough sebum and thus, lie flat. This allows your hair to lie evenly and makes you look pretty. So clearly, the answer to avoid frizz is simple. Keep those cuticles flat! The answer to ‘how do you do that’? Easy peasy - moisturize. Moisturization happens through natural oils. Frizz is a much tougher battle to fight for curly and wavy-haired women, who have naturally uneven cuticles. As a result, their sebaceous glands (the gland responsible for maintaining smoothness) finds it harder to evenly distribute the sebum. Weather: Let’s break it up. Monsoons = frizz. The excess moisture in the atmosphere finds a way into your hair shafts, swelling them up with volume and frizz. Summers = dryness. With barely any moisture left in your hair, cuticles rise up to quench their thirst, resulting in frizzy, unruly hair. Winters = static dryness. Cold, dry air causes the cuticles to lift, in addition to the atmosphere’s static charge. Hair Washes: Not using the correct shampoo or washing your hair too often – both could strip your hair off its natural oils. Excess Styling: Applying too much heat or too many chemicals often, can damage your cuticles. When this outer layer is damaged, your hair is porous and loses moisture. A Lack Of Conditioning: Deep conditioning is the one sure shot way of balancing the moisture levels in your hair. No matter what your hair type, hair care habits, or weather, products like coconut oil hydrate your scalp from root to tip. Hair that isn’t conditioned enough will naturally turn frizzy! Not Enough Water: The world’s most popular natural resource - water, is essential to combat frizzy hair. Simple to remember because the only cause behind a lion’s frizzy mane is dehydration. We don’t really understand frizz as much as we suffer from it. Frizzy hair boils down to a lack of moisture. When your cuticles are thirsty, they rise and take in the moisture from the atmosphere, giving you that extraordinary look.